37 Then he returned to his disciples and found them sleeping. "Simon," he said to Peter, "are you asleep? Could you not keep watch for one hour? 38 Watch and pray so that you will not fall into temptation. The spirit is willing, but the body is weak." 1 Returning the third time, he said to them, "Are you still sleeping and resting? Enough! The hour has come. Look, the Son of Man is betrayed into the hands of sinners. 42 Rise! Let us go! Here comes my betrayer!" Paintings by by James Jacques Tissot (French painter and illustrator, 1836-1902). Biography. 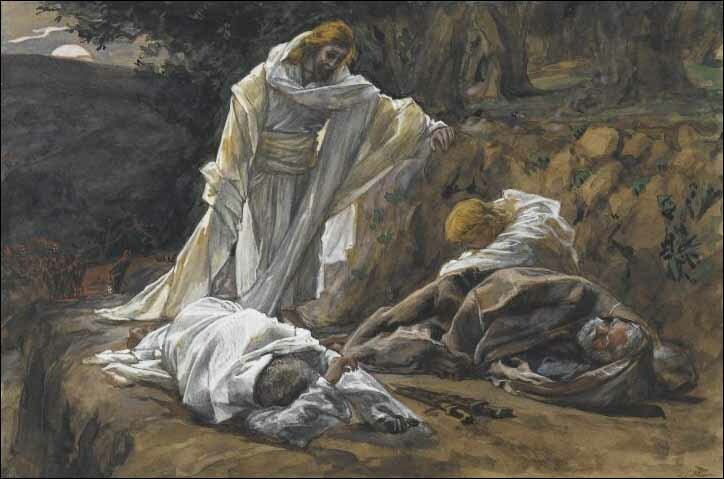 Nearly all of Tissot's paintings of the Life of Christ (1884-1896) are rendered in opaque watercolor over graphite on gray wove paper and are owned by the Brooklyn Museum, New York. Copyright © 1985-2012, Ralph F. Wilson. <pastor joyfulheart.com> All rights reserved. A single copy of this article is free. Do not put this on a website. See legal, copyright, and reprint information. To be notified about future articles, stories, and Bible studies,why don't you subscribe to our free newsletter,The Joyful Heart, by placing your e-mail address in the box below. We respect yourprivacyand never sell, rent, or loan our lists. Please don't subscribe your friends; let them decide for themselves.